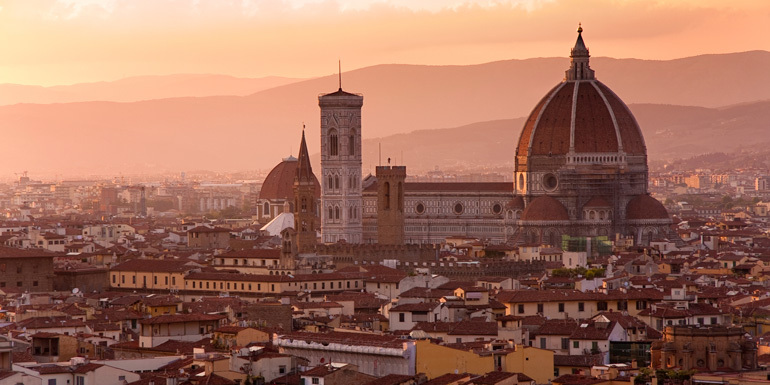 So renowned are the cultural wonders of Florence — Michelangelo’s “David,” the treasures of the Medici painting collections, the soaring dome atop the imposing Duomo — that this intimate Italian city barely requires any introduction. But the pleasures of the Tuscan capital extend far beyond centuries-old art and architecture. Today, Florence isn’t only a place to take a walk through the golden era of Italian Renaissance history; it’s also a vibrant and thriving contemporary city, filled with modern-day sybaritic pleasures aplenty, from lovely parks to tasty restaurants, high-fashion shops, and lively bars. First, of course, you’ll have to get there: The center of Florence sits a bit more than an hour’s drive from the coastal city of Livorno, where cruise ships dock. It’s well worth the transit time from port, however, so plan to book a transfer through the cruise line or make your own arrangements for a private ride. Start off with a cappuccino and a cornetto. 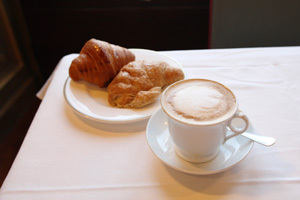 Breakfast: Caffè Cibrèo – This petite, wood-paneled spot makes a lovely place to take a cappuccino and cornetto — the Italian equivalent of a croissant — before you start your day. Actually, you could do worse — much worse! — than making a day of eating your way through the Cibrèo mini empire, returning to the trattoria by the same name (located across the street) for lunch and the next-door restaurant for dinner. Lunch: Zeb – The setting — a deli turned contemporary dine-at-the-counter joint — is far from highfalutin, but the food is incredibly high-flying. A seasonal selection of cheese- and produce-topped fresh pastas will satisfy any craving for homestyle cooking, and the perfectly prepared vegetable sides — called controni in Italian — and meaty main dishes don’t disappoint either. Dinner: Il Latini – This local institution has been pleasing crowds for decades. Its warren of high-ceilinged, simply furnished white rooms fills nightly — and a line forms out the door — with culinary pilgrims who make the journey for the kitchen’s spot-on and well-priced renditions of hearty Tuscan classics such as chicken liver crostini, pasta with wild boar ragout, and roasted rabbit. Dessert: Il Gelato di Carapina – In-the-know foodies have avowed this as the best gelato in town. Conveniently located between the Uffizi museum and the Ponte Vecchio bridge, this tiny spot uses only all-natural, seasonal ingredients and top-quality milk to make its frozen treats fresh every day. 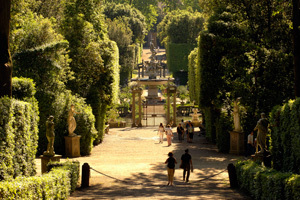 Don't leave Pitti Palace without wandering the gardens. For Everyone: Santa Maria del Fiore – This grand, multicolored, inlaid-marble-covered cathedral — more commonly known as “the Duomo” — is the first stop for many a first-time visitor to Florence. But even those on their second or third trip to the city will find something new to discover here, be it a panel of the cast-bronze doors of the baptistery, a view from the top of the cupola (that’s 460-plus steps up, no elevator), or a detail in the fresco on the inside of the gravity-defying dome. For Couples: Se-Sto on Arno – This recently opened rooftop bar and restaurant sits atop the Westin Excelsior hotel, overlooking the Arno River and Florence as a whole. Open from noon till 2 am, with lunch and dinner served around mealtimes, it’s especially great for a romantic drink on the small terrace or in front of one of the huge panoramic windows. For Families: Pitti Palace – This imposing former aristocratic residence today houses a broad selection of museums, as well as the access point for the expansive Boboli Gardens. Parents and kids can stick together while exploring or divide and conquer, checking out the painting, porcelain, silver, and costume galleries, as well as acres of open space, fountains, and tree-lined alleys that comprise the garden. For the Adventurous: Piazzale Michelangelo – This large square on a hillside just south of the historic center, on the far side of the Arno River, provides one of the best overlook points from which to get knockout views of the city and the hills beyond. The timid can get here by bus or cab, but the fitness-inclined should consider making the trek on foot: It’s about a mile-long walk from the Duomo, only the last part of which is uphill. Best of all, it’s downhill on the way back. Tip: Bring back some of Florence’s food and wine wonders by making a stop at the Mercato Centrale di San Lorenzo, a short walk northwest of the Duomo. There, you’ll find stands and stalls selling wines and spirits, cured meats and sausages, hard and soft cheeses, spice mixtures, and so much more. From midsummer and early fall — the peak of high season — you’ll want to book ahead for timed-entry tickets to avoid the lines at the city’s top cultural attractions. This is especially true of the Uffizi Gallery, for those interested in seeing the masterpieces of the Medici family’s Renaissance painting collection, and the Accademia Gallery, where Michelangelo’s famed white-marble sculpture of the slingshot-wielding, giant-slaying “David” holds court. What do you like to do in Florence?